When two-year-old Franz Charles arrives at Ellis Island in New York with his widower father and siblings in 1906, no one in his family speaks English. By the time their train reaches Johnson City, Tennessee, it is mostly empty of immigrants. Now alone in a land where they know no one, little Franz and his family must begin anew.As Franz embarks on a coming-of-age journey, he matures into a success… ful thug who collects monies owed to the head of an African American gangster bar from white gamblers in North Carolina. After a chain of events prompts Franz to murder three men, he is forced to flee from the police in Asheville to Chicago, where he soon agrees to switch places with a disgruntled marine. When his decision causes him to land in the midst of the Chinese revolution and the Japanese occupation, Franz quickly gains a reputation for his skills in hand-fighting and killing his enemies. 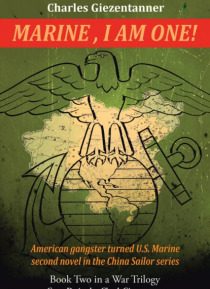 But just as Franz becomes a decorated marine, his past catches up with him.Marine I Am One shares the thrilling tale of one mans adventures after impersonates an unhappy marine and is led into a brutal war where he must prove his valor and stay one step away from those who want to find him.